General TV Channel Aden TV (First Yemeni TV established and 3rd Arabic). 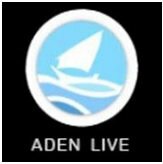 Aden Live TV is a satellite television channel that broadcasts Yemeni news (South Yemen News). The headquarters is located in London, UK.